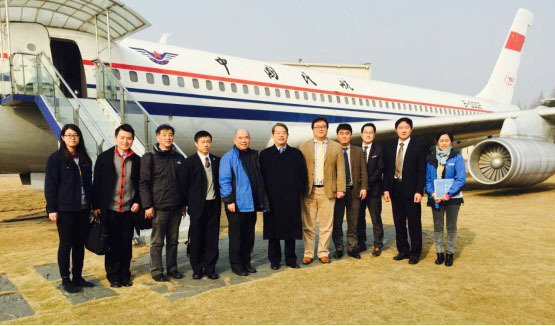 Recommended by Galleon (Shanghai) Consulting Co., Ltd., on Jan. 15th, 2016, delegates from Korean Hanwha Group visited Shanghai Society of Aeronautics (hereinafter referred as “SSA”) for working discussion and communication. WANG Wenbin, President of SSA, welcomed them in COMAC Shanghai Aircraft Manufacturing Co., Ltd. with Vice President of SSA, YU Zemin (Deputy General Manager of Shanghai Aircraft Manufacturing Co., Ltd.), Director of Aerospace Dynamics Committee of SSA and YU Naijiang (Deputy General Manager, Deputy Chief Designer of Design R&D Center of AVIC Commercial Aircraft Engine Co., Ltd.). What Hanwha Group visited were ARJ-21 assembling line in Dachang Base of Shanghai Aircraft Manufacturing Co., Ltd. and Y-10 which was independently developed by China in 1970s. Then, in their communication, President WANG Wenbin warmly welcomed Hanwha Group and introduced the working brief of SSA, meanwhile, Vice President YU Zemin presented the recent developments of ARJ-21 assembling in Shanghai Aircraft Manufacturing Co., Ltd. where he said that ARJ-21 had achieved the airworthiness certification and delivered to airlines to be on active service. The annual output of ARJ-21 would reach to 30. And C919 whose test flight was estimated in next year was the main project assembled in Pudong Base of Shanghai Aircraft Manufacturing Co., Ltd. Deputy Chief Designer YU Naijiang made a brief about the establishment and business of AVIC Commercial Aircraft Engine Co., Ltd. where he said that the mission of AVIC Commercial Aircraft Engine Co., Ltd. was to research, develop and manufacture the aero-engine. Meanwhile, it cooperated with 100+ suppliers and hoped to cooperate with Hanwha Group in various fields. KIM Seonchang, General Manager of Marketing Dept. of Hanwha Techwin said that they had a general comprehension about China aviation industry through introduction and visit. Hanwha Group was a huge group company whose main business were aviation military supplies and finance, and also hoped to cooperate with Shanghai aviation enterprises. Through the friendly communication, the both sides reached an agreement that they had the same willing to cooperate and negotiate on various parts like aero-engine, airborne equipment, aviation components processing, aviation exhibitions and aviation popularization, etc.